If you're wondering what the meaning of Tuakana/Teina is it means older or younger brother/sister. The translation its in is Te Reo Maori what most New Zealanders like to speak in NZ. In our class we were given the opportunity to read to a younger boy/girl to teach them and help them understand on what they are reading about. Every Tuesday Room 19 and Room 9 do Tuakana/Teina in the library. The reason we do it is to help the little kids get better at reading and make them understand on what their reading about.When we are reading we split up into partners, Lee - Son is my partner. 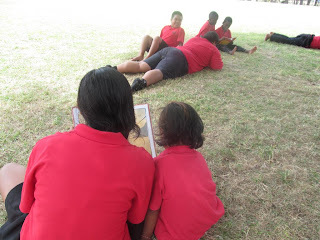 One of the things I love to do in Tuakana/Teina with my partner is reading to each other. For example she'll read the first book with a little help from me then I'll read the next. Her favourite book is the WHEELS ON THE BUS, she likes singing it so much that she can read it heaps of times. Sometimes reading with a little person can get frustrating at times! Why? well they move around a lot or either get distracted by their friends. So whenever I read with Lee-Son I try to ask as many questions as I can, so that she stays focused. I feel amazed when I help them because when I know that I'm helping someone by just reading or saying words is AMAZING!! When you just see even smiles on their face is a privilege knowing that you helped them with reading.